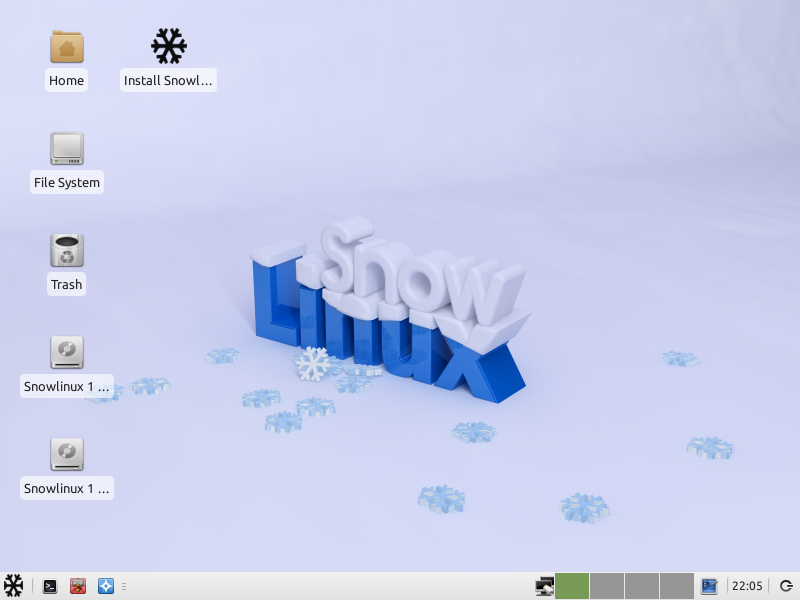 The team is proud to announce the release of Snowlinux 2 "Ice". Due drastic changes with Gnome 3 and Unity, Snowlinux is keeping Gnome 2. Snowlinux 2 "Ice" comes with the GTK theme Snowlinux-Metal-Theme, the Icon set was set to Snowlinux-Metal-Theme-Icons and the system font is "Ubuntu" by default. Also present in this edition is an improved live-installer which detects country, offers keyboard variants and uses UUID in fstab. It has installed a firewall called gufw. Apturl was ported from Ubuntu to Debian and it was made functional. To improve the difference between user and root terminal the terminal colors were introduced. To be more out-of-the-box OpenJDK 6 Java has been made availble in the default installation. Snowlinux 2 "Ice" comes with chromium-browser, icedove, rhythmbox, shotwell. Snowlinux 2 "Ice" is based upon Linux Debian 6 "Squeeze" Stable. It comes with the long-term-support (LTS) Linux kernel 2.6.32 and Gnnome 2.30 which were made available upstream. It has installed chromium-browser, icedove, rhythmbox and shotwell by default. 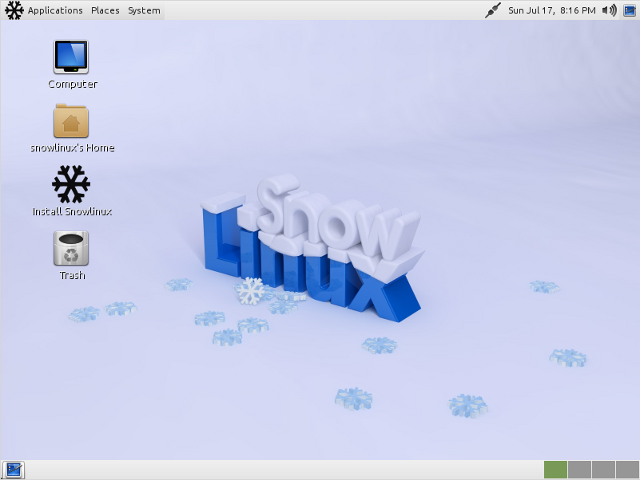 Snowlinux 2 "Ice" is supported until Februar 2014. Snowlinux 2 "Ice" is 100 % compatible with Debian's Repository. We are looking forward to your comment on this release. Thank you for using Snowlinux and enjoy this new release. Snowlinux 2 "Ice" XFCE released! Due drastic changes with Gnome 3 and Unity, XFCE is growing more and more up. XFCE is quite similar to the most popular Desktop environment Gnome 2 and offers an alternative for all former Gnome 2 users. This is one of the reason why Snowlinux XFCE got so much new features and improvements. It should not lack some features and functions which are available in the main edition. We are trying to let XFCE act like Gnome 2 and to offer an alternative for all former Gnome 2 users. Snowlinux 2 "Ice" XFCE comes by default with the GTK theme Snowlinux-Metal-Theme and the Icon set was set to Snowlinux-Metal-Theme-Icons system font is "Ubuntu". Also present in this edition is an improved live-installer which detects country, offers keyboard variants and uses UUID in fstab. It has been installed a firewall called gufw. Apturl was ported from Ubuntu to Debian and it was made functional. To improve the difference between user and root terminal the terminal colors were introduced. To be more out-of-the-box OpenJDK 6 Java has been made availble in the default installation. Snowlinux 2 "Ice" XFCE comes with chromium-browser, icedove, banshee, shotwell. Snowlinux 2 "Ice" is based upon Linux Debian 6 "Squeeze" Stable. It comes with the long-term-support (LTS) Linux kernel 2.6.32 and XFCE 4.6.2 which were made available upstream. It has installed chromium-browser, icedove, banshee and shotwell by default. Snowlinux "Ice" is 100 % compatible with Debian's Repository. If you get a keyring error please install debian-multimedia-keyring.